As I mentioned in the June newsletter I would like to incorporate a book club into our monthly newsletter. Reading a good book is a fantastic way to incorporate English into your life in an enjoyable way. 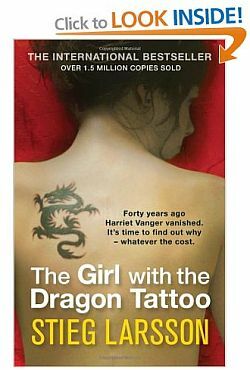 Right now I am reading "The Girl with the Dragon Tattoo" (one of my students wanted to work on it with me), so I thought we could start with that book. Apparently it does have quite a bit of violence towards women in later chapters though, so I am not sure if it is the best book to start our book club with. As I mentioned in the newsletter, I invite you to share a list of your favorite books and novels that you would like to see included in our book club. This could be the perfect opportunity for you to review a favorite novel or to read a new one with my help and guidance. Just leave your suggestions as a comment below and I'll create a reading list for us all to follow. Sophie's World is kind of a lesson given by a philosopher to the young little girl who is 14 and her father is in abroad. In the book author awesomely gives some historical knowledge about the top philosophers who exactly have changed the world we live in. While the writer doing this he uses some modern examples to make little Sophie understands so readers too. Before I have started to read that book I would never have known that I would like to learn more about Ancient Greek or Nordic Gods or history of Christianity. It gets ten points from me..I assume that one of the follower would say "oh Philosophy, yayk'" but believe me after you start to dig that book you'll discover the philosopher in you. Thank you so much for everything you do here. I love receiving your newsletter and listening to you. So far people have suggested fiction books but I would like to see you explore a non-fiction book. Anything self-help related. I am currently reading "Saving Your Marriage Before It Starts" by Drs. Les and Leslie Parrott. It is so useful and easy to understand. I am learning about how to make all my relationships better. Do you think you could add this book to your list? I`m very selective as to what book I read and what movies I watch. It`s not just to be entertained/I want to take something away (learn something). Hello Diana and the subscribers of this awesome blog. Since I have started to learn English I was able to finish many books such as The Great Gatsby, Old Man and the Sea etc. But there were two awesome books I would like to share with you and read them together again. One of them is by Paolo Coelho named The Alchemist and the other one is by Jostein Gaarder named Sophie's World... Both of them are so effective and influencing books for who wants to learn the meaning of life. Also both of them are so easy to read and understand. Keep the ideas and suggestions coming everyone!